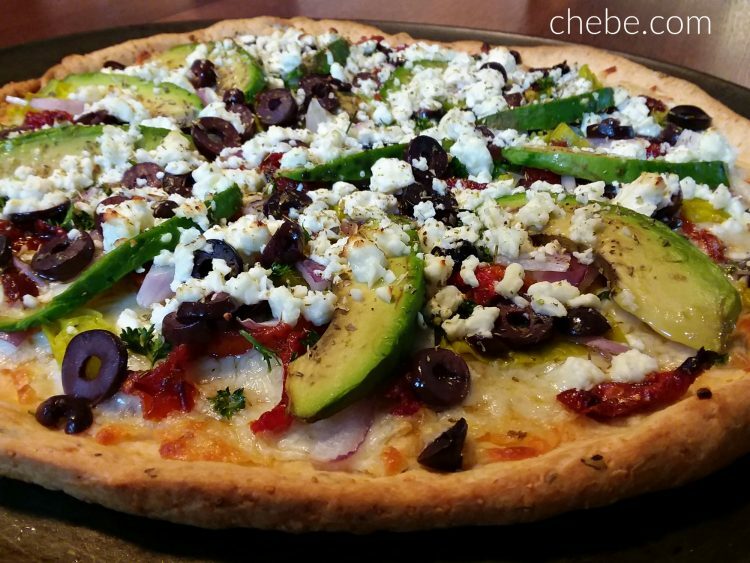 If you like to venture out of the common zone of pizza toppings, you’ll want to try this one. 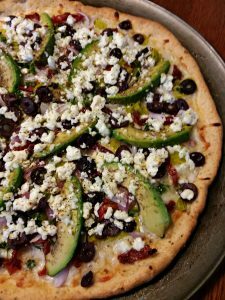 Although the avocado originates from what is now Mexico, its flavor and texture blend so well with the Mediterranean flavors of feta cheese, kalamata olives, pepperoncini peppers and sun dried tomatoes. 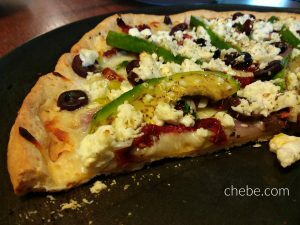 And with the gluten and grain free Chēbē dough brushed with garlic butter… wow! 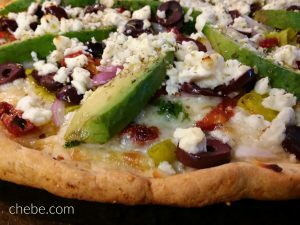 Grainy pizza dough has nothing on this! Prepare the dough according to package directions. Blend until the dough is smooth. With your hands and a rolling pin, flatten out to about 1/8” thick. (If your pizza is round, it will be about 13” diameter.) You can flatten it straight on to the pizza pan, or on a clean surface and later transfer to a pan. 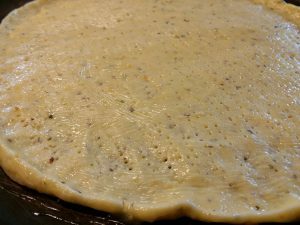 After the dough is flattened and on the baking pan, make a small edge by pinching the dough around the circumference, then poke the dough all over with the tines of a fork (to allow air bubbles to escape). Melt the butter with the garlic powder. Brush this all over the surface and the edges of the pizza crust. Bake for 9 – 10 minutes. Remove the pizza and add the remaining toppings. Return to the oven for 8 minutes and it’s done! You’re going to enjoy this one!